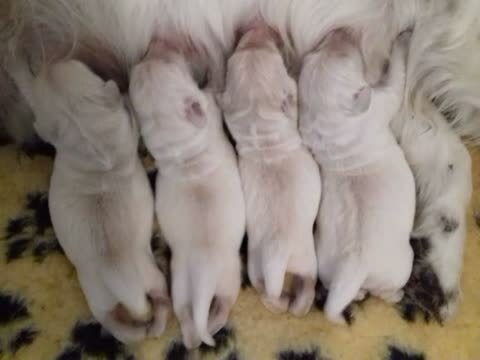 The Pups came quickly and with no problems. Pups are now almost 6 weeks old. They are on 3 solid meals a day and they all weigh over 10lbs. The Pups have gone to their new homes now (except Fuchsia) and their final pictures are below. Fuchsia is staying for a few extra days whilst her new owners are on Holidy and there are some pictures of her antics below. Fuchsia has now gone to her new home and pictures of her leaving are below. Jazmin at 40 Days in Whelp, taking it easy in her favourite chair. All ready for the big day, just need some puppies now. Jazmin with just a week to go. Pumpkin trying solid food for the first time at 21 Days. Fuchsia trying solid food for the first time at 21 Days. Apple trying solid food for the first time at 21 Days. Lilac trying solid food for the first time at 21 Days. Do you know there is a big Dog watching us? "Take the Tube" they said, I don't get it. Do you like my Easter Bonnet? "Can I take the ears off now Please"
So how far did you say Australia was? Why can't we play with the babies? We are off to the Vet's for a checkup and chips, Sounds tasty. Well that wasn't what we were expecting but we were all very brave. Is there food in here? Going for a Bath they said, Well I won't fall for that again. Goodbye Pumpkin, Be a good boy for your new family. I was brave wasn't I Mummy? Perhaps I'll get a real collar now! This is my New Mummy, She's going to take good care of me. This is where I shall Re-Plant it. Perhaps just a little deeper. Mia with Great Grandmother Sophie. You keep lookout while I dig this hole. This is what happens when you get dirty in the Garden. Can I go and dig another hole now please. Why are you cutting my collar off? Jazmin was taken for a Scan on Thursday 5th November 2015.
and carrying at least 6 Pups. She will have a second scan next week for a more accurate count.